Despite not winning the league title, Borussia Dortmund is in a very good place, set up for a bright future, with someone like Marco Reus on the team. Reus is the only remaining star from the team that made the Champions League final in 2013, while Jurgen Klopp, Mats Hummels, Robert Lewandowski and Mario Gotze have all moved on, usually to the same place. Reus, who won’t be in Euro 2016, making him miss the second consecutive major tournament, was born in Dortmund, played for their youth setup, but his big breakthrough came with Rot Weiss Ahlen. He had three fantastic seasons playing for Borussia Monchengladbach, and then, in 2012, returned for Dortmund, paying €17.1 million to bring him back. Dortmund were two-time Bundesliga champions at the time. 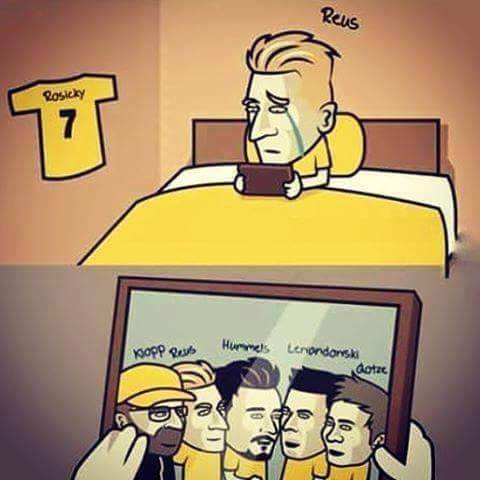 Reus hasn’t won the league title with Dortmund, but was part of a team that played some stunning football while it was healthy, and before it broke apart, taking the club to its second Champions League final, losing to their nemesis, Bayern Munich. Bayern has won all the league titles (four in a row) since and has also broken apart Dortmund’s talented team with money and power. Klopp didn’t go to Bayern. He left after the disappointing 2014-2015 season, waiting for the right job to open up, signing with Liverpool midway through this season. But Lewandowski forced Dortmund to give him away for free: He didn’t want to go anywhere but Bayern and Dortmund didn’t plan on selling him. Gotze left to Bayern as they triggered his release clause. Hummels, who once promised he’ll never play there, will be joining Bayern Munich after Euro 2016. Reus doesn’t have a bad team around him: Pierre-Emerick Aubemyang and Henrikh Mkhitaryan are fantastic players, and Dortmund was one of the most exciting teams to watch this season in Europe, giving Bayern a pretty good fight until a certain point. But when looking back at what could have been and where things stand now, one can’t help but feel nostalgic, and a little bit sad about how things work in football, although it’s not that different in life.